Some weeks ago, there was a package delivered from Hector Beverages. 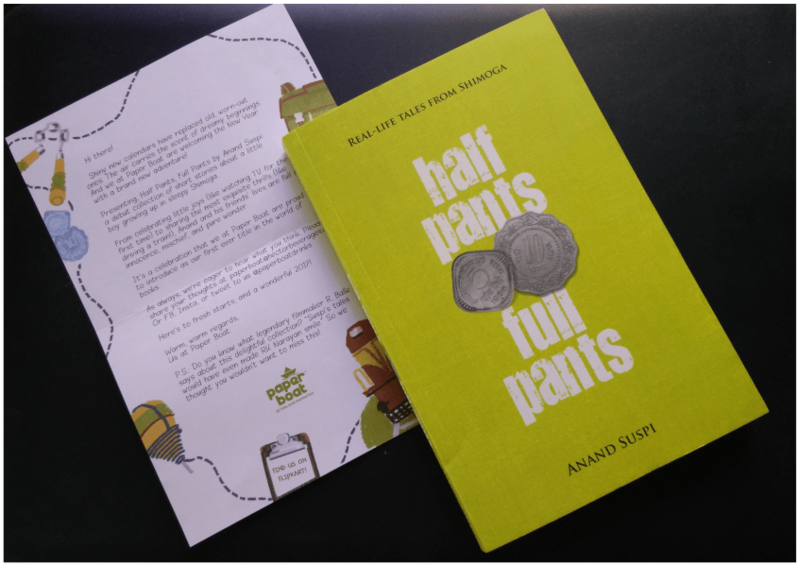 Too small to be another flavour of their Paper Boat drinks and bigger than the Paper Boat Chikki, and it turned out to be a book – “Half Pants Full Pants” – by Anand “Suspi” Subbarao. Unfortunately, after the initial glance-through, the book just lay in the cupboard for a while (my love for reading has been in hibernate mode for a while now), before I finally decided to check it out – and wow, what an enjoyable read it is! The line above the title says, “Real life tales from Shimoga” and that instantly reminded me of a couple of my classmates from school in Yelahanka, Bangalore back in the ’80s. Shimoga was their hometown, and remembering these classmates brought back a flood of memories of stories they’d share when back at school after the summer holidays, as well as some of the Kannada words and phrases sprinkled throughout the book. R.Balki hits the nail on the head in his foreword, and this book is indeed a worthy “follow up” to that timeless classic, “Malgudi Days” by R.K Narayan. I really liked that the stories themselves are all broken down into short anecdotes of 5-6 pages each, so one can read several of them at a time, and then get back to the book after a while (instead of long-winding episodes) – almost like having a conversation with someone narrating these incidents. The folks at Paper Boat Drinks had previously sent across books as well but those were reprints of “Three Men in a Boat” and “Jungle Book” – Half Pants Full Pants is their first foray into publishing and wow, what a winner with the first book. Like those reprints, the new beginning with Suspi’s book ties in perfectly with their nostalgia themed drinks and that “bachpan connect”.